Some people believe that Nostradamus was foretelling the election of Donald Trump when he predicted, “The great shameless, audacious bawler, he will be elected governor of the army.” Not a bad prediction considering he was writing in 1566. 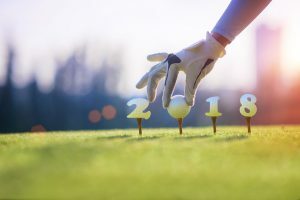 Want to know what will happen in the 2018 golf world? One of the reasons we love golf is that it is full of surprises. On and off the course predictions are difficult. For this very reason, it’s great fun to discuss and debate the future. So, just for fun, read on for a bunch of 2018 golf predictions. Predicting the future is best done with an eye to the past. What was your highlight of 2017? For many, it was a moment on the 13th at the Open at Royal Birkdale. Jordon Spieth was at a turning point. He could have crashed and burned just as he had the previous year at the Masters. From an unplayable position and in a tie with Kucher he was set to lose. He took his next shot from the driving range and then with three birdies and an eagle, lifted the Claret Jug. This proves that one thing we can be sure of is, this game we love is full of surprises. Before we get more deeply into the 2018 golf predictions it is worth mentioning that 2018 is a year full of sport and two certain predictions. The Winter Olympics and then the Winter Paralympics in Pyeongchang, South Korea in February and March will be the biggest event of the year. A safe prediction will be, last times host and top medal winner, Russia, will win no medals. They are excluded from the games due to doping offenses. Another major global event will be the Soccer World Cup which takes place in Russia in June and July. It’s safe to predict that the USA will not win. The US team failed to qualify for the tournament. Tiger Woods must appear more often than any player in annual golf predictions. At the Hero World Challenge last year he achieved eight under par and beat the likes of world number 1, Duston Johnson. His recent spinal operation has left him pain-free for the first time in many years. What can he achieve in 2018? Sponsors love him and golf fans love him too. He could surprise us with a return to winning ways. So Tiger to win a tournament in 2018 is my first 2018 golf prediction. Jordon Spieth still needs to win the PGA Championship to complete a career grand slam. After his performance at the Open at Royal Birkdale in 2017, he has demonstrated the mental strength to deliver when it matters. He is young and so the pressure of having to achieve his career grand slam before it’s too late is not there. Speith jointly owns the Masters Scoring Record with an 18-under 270 to win in 2015. He shares this record with Tiger Woods. My prediction is he will also complete his career grand slam in 2018. It’s always exciting to watch the new talent emerge from obscurity. Tiger Woods had a great school golf record and tying with his record is Maverick McNealy. He starts this season with no status on any major tour just like Jordan Spieth in 2012. It didn’t hold Jordan back and it needn’t hold McNealy back either. My prediction is McNealy is the 2018 golf newcomer to watch. “Sometimes adversity is what you need to face in order to become successful.” So said Zig Zigler. Lexi Thompson has had a tough time in 2017. A bizarre four-stroke penalty at the ANA Inspiration cost her a major championship title. Later in the year, she has had to endure family illness and bereavement. In 2017, her nine top-ten finishes, two of them wins shows her talent. I predict, Lexi Thompson coming back from adversity in 2018 and winning several majors. The Ryder Cup will be very closely contested in 2018. The US has not won in Europe for 25 years. With half a dozen superstars in the team and local knowledge, Europe looks a good bet. The US win in Hazeltine was impressive and perhaps the time has come for a US victory in Europe. My prediction is that the US will have to wait a little longer and the Europeans will triumph. Golf ball brands are competing for your golfing dollar. The balls available in 2018 include soft, hard, control, distance, spin reduction, soft center and more. The choice is bewildering. My prediction is your ball will be the only item of golf equipment you use for every shot. Find one you like and stick with it, at least for 2018. Use it in practice and competition. Golf has seen huge steps forward in technology. Clubs, balls, and clothing have all benefitted from this. If you don’t own a golf GPS you may be one of the many golfers who will feel that 2018 is the year to invest. With a golf GPS, you can play any course as if you have played it many times before. The technology has come on so far and now provides powerful, pinpoint information. The addition of swing analysis, details about locations of water and traps, and distance to the hole all support your golf game. Post-Game analytics help you improve too. I predict better scores and more enjoyable golf for users of golf GPS. The 2018 golf year will see majors at, US Masters at Augusta National in April, US Open at Shinnecock Hills in June, Open Championship at Carnoustie and US PGA at Bellerive in August. Lots of great golf to look forward to. Your golf year might see you with a new club, a new course or a new love for the game. Whatever it is, my confident prediction is golf will still hold a fascination for golfers all over the world for many years to come. To read more about golf and golf gear, click here.